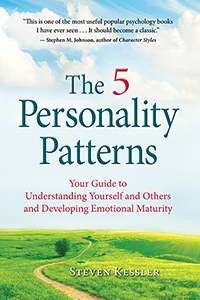 Since I self-published The 5 Personality Patterns three years ago, I’ve sold over 10,000 copies. And at full price, I’m happy to say, not at give-away prices. About half of those sales were paperbacks, sold for $16 to $21, while the other half were ebooks, sold for $9.99 and up. I am a first-time author and self-publisher, so this has involved a steep learning curve and a ton of work, but it has also given me a profit of over $60,000. What are the ingredients needed for this success? Here’s the main point: to decide to buy your book, each potential buyer must go through a series of steps. They must learn that the book exists, determine what it offers them, and decide that it gives them more than it costs. So you must arrange your marketing efforts to guide them through this series of steps. If you succeed in guiding them through these steps, many of them will buy your book. If you lose them anywhere along the way, you lose the sale. Well-chosen keywords on Amazon. Amazon is a giant search engine for books. When your ideal readers type what they’re looking for into Amazon’s search bar, make sure that Amazon shows them your book, too. Sponsored ads on Amazon. Again, these are keyword driven. I began using them about six months after publishing, and they immediately doubled my sales for both print and kindle editions; my return on investment is about $3 or $4 of additional royalties for every dollar I spend on the ads. Value — Content that is truly valuable to the reader. This is crucial,I think. This is what produces word of mouth recommendations, readers buying second, third, and forth copies as gifts to friends, and the use of your book by groups, classes, etc. This is what generates increasing sales as the months and years pass. Over the three years since my book was published, sales have steadily increased without any change in my ads or marketing, which suggests to me that news of the book is spreading on its own. This increase arises directly from the value that readers get from the book, not from ad campaigns. You can’t buy this kind of growth with ads; you have to put the value into the book at the start. Making the sale — Your book’s page on Amazon (and on your website) has one goal: to convince the viewer to buy your book. It does that by showing the potential buyer what’s in it for them — that is, what value they will get from buying/reading your book. If they calculate that they will get more out of the book than they spend on it, they will buy it. Who wouldn’t? Professional quality writing, editing, and interior design. Amazon’s Look Inside feature will show all this. A persuasive description. This is sales copy, not a review. This is where you explicitly tell them what value they will get from your book. What’s in it for them? Your Website — This contributes some to discoverability, provides a taste of what’s in the book, sells the book directly, and, most importantly, captures readers’ contact info by giving them free content (PDFs,audio recordings, etc.) in exchange for their name and email address. I’m not sure how much this contributed to my total sales, but I’m sure it was some. Less than 5 percent of my sales occur on my website, while about 70 percent are through Amazon and about 25 percent through Ingram and other channels. Your Newsletter — This helps you maintain contact with your readers and strengthen their connection to you. You do this by providing them with more value (tips, freebies, suggestions, ideas, wisdom …), info about you, info on discounts, etc. Again, I’m not sure how much this contributed, but I’m sure it was some. These are the big factors, as far as I can tell. I haven’t gone into pricing, distribution channels, selling to bookstores and libraries, book tours, and a dozen other parts of the big picture that you may want to get into, but these are the main things you’ll need to master, I think. And I have only listed them, not tried to flesh out exactly how to do them, as that would take pages and pages for each one. But if you google them, you’ll find many free articles on how to do each one. You’ll also find many paid courses on how to do them. I’ve found that most of the info I’ve needed is available for free if I look for it, and that paid courses mostly provide hand-holding and the motivation to do it, but you may want that, too. You may also want to hire others to do some of this work for you. Remember, you don’t have to master every skill yourself, but you do have to get it done somehow, by someone. Finding the right balance is up to you. When I first decided to self-publish a book, I had no idea that I would have to learn about design, production, discoverability, ads, or any of the sales and marketing stuff. And frankly, I still wish I didn’t have to know about it. I don’t care about it like I care about the content and the writing. But it is part of the business of publishing, so to succeed in this business, you have to either do it yourself or pay someone else to do it. I hope this has been helpful, and I wish you great success in selling your books.